Jesus told His disciples a parable of a Sower who went out to scatter seeds in his field. NE DAY JESUS went out of Capernaum with his disciples and walked by the seaside. Great crowds followed along the beach; for they thought he might be going away from their city again, and they wished to go with him. They pressed so close behind that Jesus stepped into a boat at the water's edge and sat down to teach them, while they stood listening on the shore. 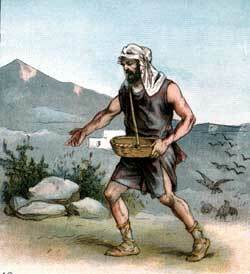 "One day a sower went out to the field with a bag of grain and began to scatter the seeds upon the ground. The breeze caught each handful he threw while walking to and fro, and helped to scatter the grain. But some of the seeds blew upon the roadside. The birds flying overhead saw them lying uncovered on the ground, so they flew down and ate the seeds. Other seeds fell upon stony places, where the soil was so shallow they could take no deep root, and soon they withered after they had sprouted and begun to grow. Still other seeds fell in thorny places, and the thorns grew so fast that they choke out the good seed and it died. "But not all the seed was wasted; for some of it fell into good ground, and there it sprouted and sent its roots down deep into the rich soil. By and by it grew up into stalks of grain that yielded many times more seeds than were first scattered on the ground." The disciples wondered what this story might mean. They did not know why Jesus was telling stories instead of preaching sermons that people could understand. So they came to Jesus in the boat and asked, "Why are you teaching the people with these parables?" Jesus answered, "Because I know you will seek to understand the meaning of them, for it is given to you to know the meaning of the deep truths of the kingdom of heaven. Others who hear the stories will not seek to understand the meaning of them, for they are not careful to prepare their hearts to receive the forgiveness of their sins. The prophet Isaiah spoke of them when he said, 'By hearing ye shall hear and not understand; and seeing ye shall see and not know.' Their eyes are closed, so they can not see the salvation God has sent into the world; and their ears are stopped, so they can not hear the good news of salvation and receive it into their hearts. But blessed are your eyes, for they see; and blessed are your ears, for they hear." Then Jesus explained to the disciples the meaning of the story about the sower and his seed. "The sower," he said, "is the one who speaks the word of God, and the different kinds of soil are the different conditions of the hearts of people who hear the word of God spoken. Those who hear the word but do not seek to understand it, are like the roadside by which the seeds fell. Just as the birds flew down and ate those seeds, so the evil one comes by and causes those people to forget the truths they have heard from God's word. "Those who gladly hear the word of God, but do not continue to obey it, are like the stony places, where the seeds fell but could not grow because they could not take deep roots in the stony soil. "Those who hear and receive the word of God into their hearts, but afterwards allow cares and troubles or riches and pleasures to crowd out the good truths, are like the soil where thorns sprang up and choked out the good seed. "But those who hear and who obey the word of God are like the good ground, where some of the seeds fell and sprouted and grew into stalks that bore much grain." Afterwards Jesus told another story to the people. This time he said: "The kingdom of heaven is like a man who sowed good seeds in his field; but while men slept an enemy came to the field and scattered bad seeds everywhere. These bad seeds are called tares. By and by the good seeds and the bad seeds both began to grow. And after they became stalks, and heads of grain appeared, the servants of the man came to him and asked, 'Did you not sow good seeds in your field? How then are these tares growing everywhere beside the stalks of wheat?' The man answered, 'An enemy has sown the tares.' Then the servants asked, 'Shall we gather out the tares?' but the master said, 'Wait until the time for harvest, lest while you pull up the tares you also pull up stalks of wheat. When all are ripened together, I will send reapers to first gather out the tares and tie them into bundles to be thrown into the fire. Then they will gather the wheat and put it into my barn.'" The third story Jesus told was about a grain of mustard seed. He said the kingdom of heaven is like such a tiny grain, which, after it was sown quickly grew into a bush so large that even the birds could sit in the branches of it. Then he said, "The kingdom of heaven is also like leaven, or yeast, which a woman put into her dough when she was mixing bread. The yeast soon worked through all the dough and caused it to rise light and make good bread." Perhaps the women who heard this story wondered how the kingdom of heaven could really be like yeast. When Jesus finished all his stories he sent the people away, and afterwards he left the boat and also returned to the city. Then the disciples asked him to explain the meaning of the story about the tares. Jesus said: "The good seed are the people of God; the field is the world; and the man who sowed the good seed is the Son of man. The bad seed, or tares, are the people of the wicked one, and the enemy is Satan. The harvest is the end of the world, and the reapers are the angels. Just as the tares are gathered in bundles and thrown into the fire, so the wicked people will be separated from the good people at the end of the world. Then the good people will shine as brightly as the sun in the kingdom of God, their Father."